Sébastien Loeb has won the World Drivers' Championship a record nine times. The World Rally Championship (WRC) is a rallying series administrated by Fédération Internationale de l'Automobile (FIA), motorsport's world governing body. The series currently consists of 13 three-day events driven on surfaces that range from gravel and tarmac to snow and ice. Each rally is split into 15–25 special stages, which are run against the clock on closed roads. The WRC was formed from well-known and popular international rallies, most of which had previously been part of the European Rally Championship and/or the International Championship for Manufacturers; the series was first contested in 1973. The drivers' championship was first awarded in 1977 and 1978 as an FIA Cup for Drivers title, to Sandro Munari and Markku Alén, respectively. The first official world champion in rallying was Björn Waldegård in 1979. Sébastien Loeb holds the record for the most drivers' championships, winning nine during his career. He also holds the record for the most championships won in a row; he won nine consecutive titles from 2004 to 2012. Sébastien Ogier is second with six championships won consecutively from 2013 to 2018. France have won the most titles with 16 championships between 3 drivers. Finland are second with 14 championships between 7 different drivers. Citroën cars have won the most drivers' championships with nine titles, all of them with Loeb. 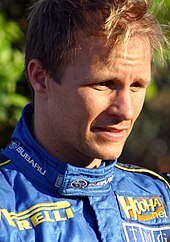 Petter Solberg won the World Rally Championship in 2003. 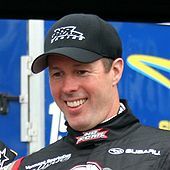 Sébastien Ogier has the second most drivers' titles with six. Tommi Mäkinen won four World Rally Championships. Markku Alén driving a Lancia Delta HF 4WD in 1987. Rally versions of the Delta brought Lancia four drivers' titles. A. ^ Until 1997, only a certain number (seven, eight or nine) of a driver's best results counted towards the championship. The points column lists the points counted in the championship. B. a b In 1977 and 1978, the drivers' championships was the FIA Cup for Drivers. C. ^ Alén drove a Lancia Stratos HF at the Rallye Sanremo and at the Lombard RAC Rally. D. ^ Waldegård drove a Mercedes 450 SLC 5.0 at the endurance rallies; the Safari Rally and the Rallye Côte d'Ivoire. "FIA World Championship for Drivers". World Rally Championship. Retrieved 3 November 2011. ^ "About FIA". FIA. Archived from the original on 28 June 2011. Retrieved 31 October 2008. ^ "What is WRC?". World Rally Championship. Archived from the original on 9 April 2009. Retrieved 10 November 2008. ^ "The WRC's greatest drivers". World Rally Championship. 23 July 2008. Archived from the original on 8 October 2008. Retrieved 10 November 2008. ^ "Loeb clinches eighth title". Sky Sports. 12 November 2011. Retrieved 13 November 2011. ^ "Hirvonen's exit hands eighth straight world title to Loeb". CNN. 11 November 2011. Retrieved 13 November 2011. ^ "1997 – Subaru". Subaru. Archived from the original on 12 April 2009. Retrieved 10 December 2008. ^ Hope-Frost, Henry; John Davenport (2004). The Complete Book of the World Rally Championship. MotorBooks/MBI Publishing Company. p. 13. ISBN 0-7603-1954-5. ^ "Björn Waldegård". Rally Base. Retrieved 10 December 2008.